Blackhawk is a supercharged, street-wise brush font bursting with energy. 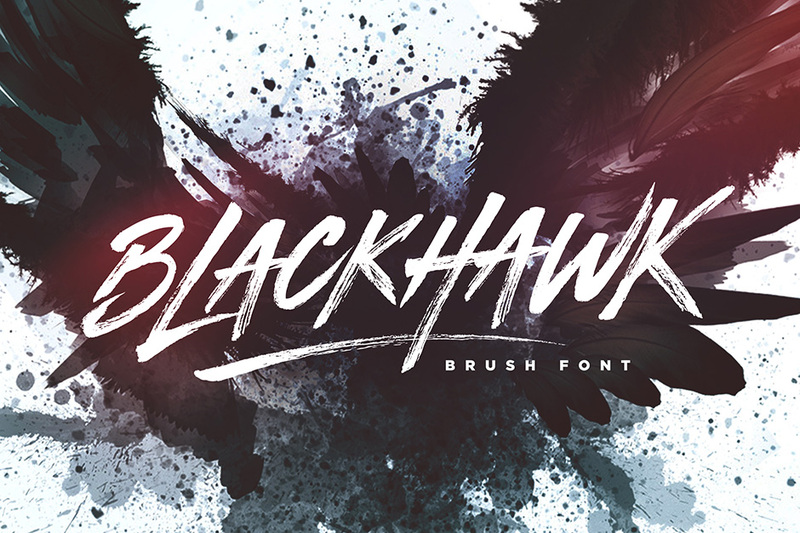 With extra attention to quick strokes and sharp details, Blackhawk is guaranteed to deliver an unapologetically loud & fast-paced message; ideal for logos, apparel, quotes, product packaging, or anything that needs a typographic turbo-boost! • Blackhawk: A hand-made, all-capitals brush font which has a complete set of alternate A-Z characters. Simply switch between upper & lower case to access the alternates. (Tip: Try mixing up both upper and lowercase characters in a word to achieve the best text layout). • Blackhawk Italic: A slanted version of the regular font, creating faster movement in the characters. Blackhawk: A hand-made, all-capitals brush font which has a complete set of alternate A-Z characters. File size is approx 4.2MB (9.3MB unzipped), offered as a single download. I like this font so much! Thanks so much for your lovely comment! We are big fans of Set Sail ourselves and this is a lovely font :). We hope you get loads of use out of this one!